Review of the book: “Termites of the Gods” by Siyakha Mguni, Wits University Press, South Africa (2015) with emphasis on the connection with honeybees. Fig 1. Example of a Bushman (San) shelter on the mountain above the village of Aurora where the wall is covered in faded paintings of a wide variety of animals and people seen from a distance as red blotches. 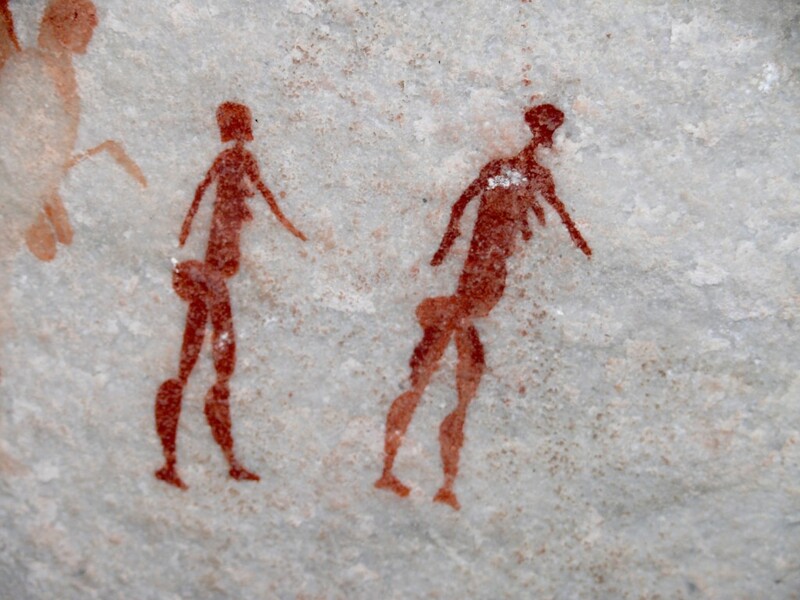 Scenes of honeybee nests and honey hunting are depicted in rock art (Fig. 1) at various locations in southern Africa. There is a particular painting from the shelter at the Toghwana Dam site in southern Zimbabwe which has been reproduced many times (Pager 1971, Guy 1972, Crane 1982) in beekeeping literature (Fig. 2) depicting what has been interpreted as a man with a lit torch besides a bees’ nest with a stream of bees emerging from one side of the nest. 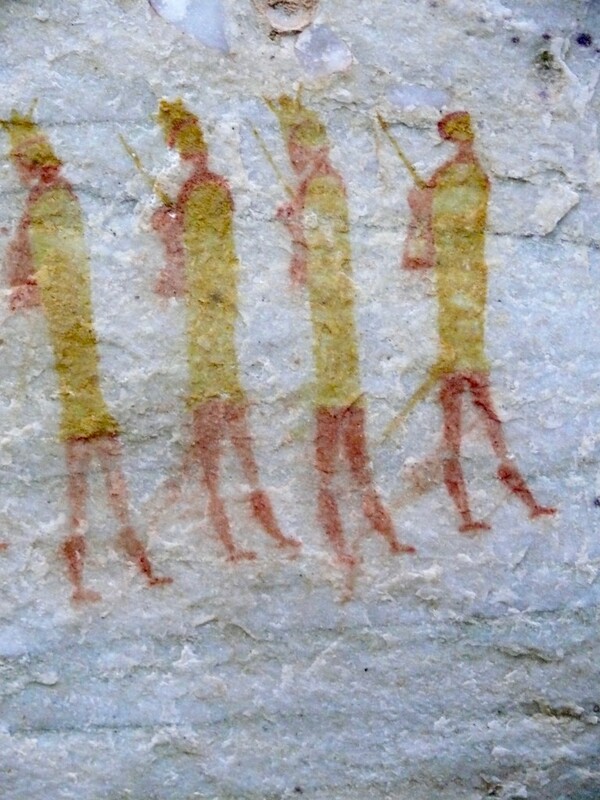 This would intimate that smoke was used by the Bushmen (San) in calming the bees, even though the ‘flames’ of the torch are directed backwards as if blown thus by a strong wind. Fig 2. 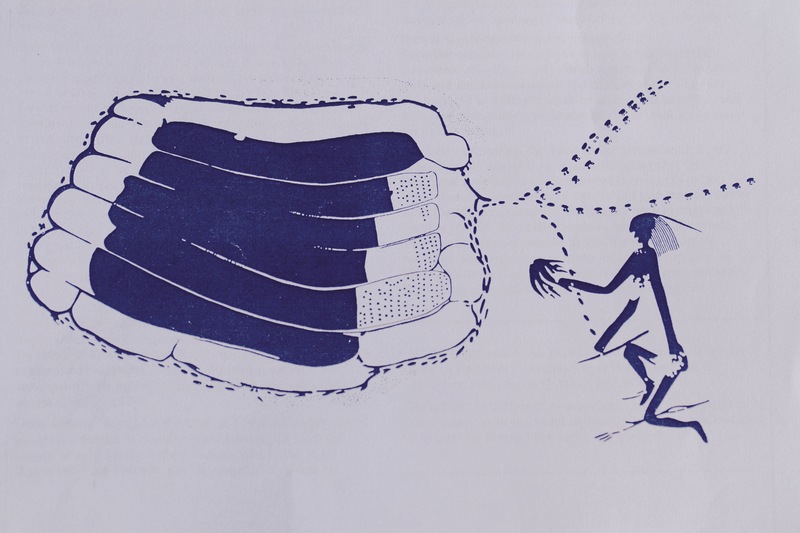 A drawing of a section of the paintings at the Toghwana Dam site interpreted earlier as bees emanating from a bees’ nest but now interpreted by Siyakha MGuni as termite alates leaving a termite nest (reproduced from a drawing by Harald Pager depicted on the cover of the South African Bee Journal 46 (6) of 1974). Siyakha Mguni demonstrates convincingly in his book “Termites of the Gods” that this painting actually depicts termite alates leaving the nest but still has a spiritual connection with honeybees. 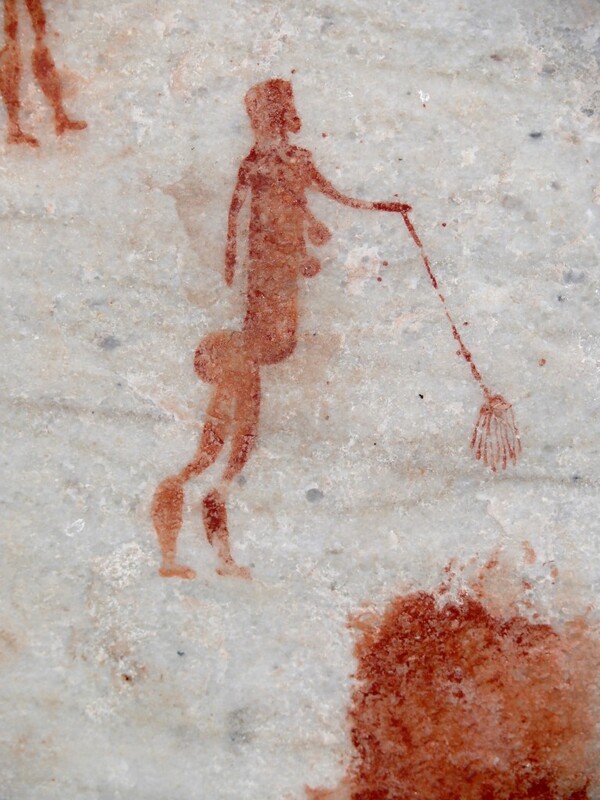 This Toghwana Dam painting falls into the category of ‘formlings’, of oblong or ovoid blobs enclosed by a line surrounding them, whose semblance has puzzled archaeologists over the last 200 years with many varied and unsatisfactory explanations been given. These formlings are concentrated in shelters mostly in southern Zimbabwe but occur also in the northern most regions of South Africa. The largest formling depiction is found in the Waterberg District of Limpopo Province and covers 12m² in area on the rock face. This book is a study of these ‘formlings’ and the elucidation of their meaning, where we are taken into the spiritual beliefs of the San and their cosmic world view. Siyakha Mguni has presented an interesting hypothesis as to their meaning, although he does not claim to be able to understand everything associated with the concept of formlings. For the San, fat is a substance that possesses strong ‘potency’ – a supernatural force which like electricity, is an invisible but powerful force which manifests itself in the form of light, heat and kinetic energy. This potency is believed to be particularly saturated in large antelope (eland, kudu, hartebeest and gemsbok) and giraffes, buffalo, elephant and rhino which contain relatively large amounts of fat. Certain insects, principally honeybees and termites, are also regarded to possess strong potency, as does their honey and fat respectively. It is recorded elsewhere that early European hunters in Africa were fully aware of this demand for fat by indigenous peoples, where the killing of a hippo or elephant was regarded with much joy because of the copious amounts of fat which was normally a rare resource. Small antelope are largely devoid of fat. For example, William Burchell the naturalist and explorer, while traversing Bushmanland from Klaarwater (Philippolis) to Graaff Reinet in 1811 was visited by four female San whom he hospitably received. He records “A wooden bowl, in which was left a quantity of liquid Hippopotamus grease, was eagerly seized upon, and its contents drunk off, with an avidity most nauseous to behold; while that which still adhered to the bowl, they carefully scraped out with their hands, and smeared on their bodies” (Buchanan,2015). For people who had been subsiding on lizards, snakes, tortoises, ant’s eggs and roots, this was a substantial meal. As indicated by Burchell, the fat, usually mixed with herbs such as Buchu where available, was also used as a sunscreen, to keep the skin moist, and as a deterrent to biting insects. The early part of the book entails the analysis of the explanations given by earlier researchers and then delves into the spirit world of the San. The conclusion that he draws is that these formlings represent the inner, underground cavern within the centre of a termite nest where the relatively enormous queen termite is found surrounded by her eggs and pupae. Known as ‘Bushman rice’, these eggs and pupae were excavated by the Bushmen and eaten. 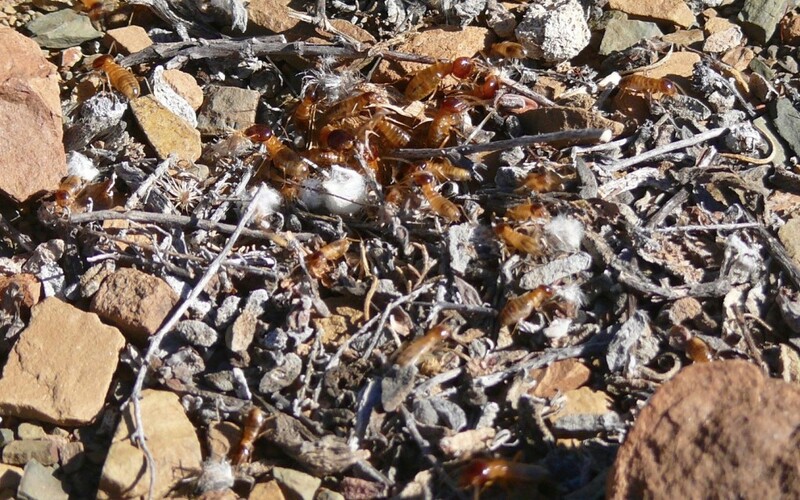 However, the reproductive flying ‘white-ants’ or alates, (Fig.3) were far more prized because they were filled with fat, a substance much in demand by hunter-gatherers. Fig 3. 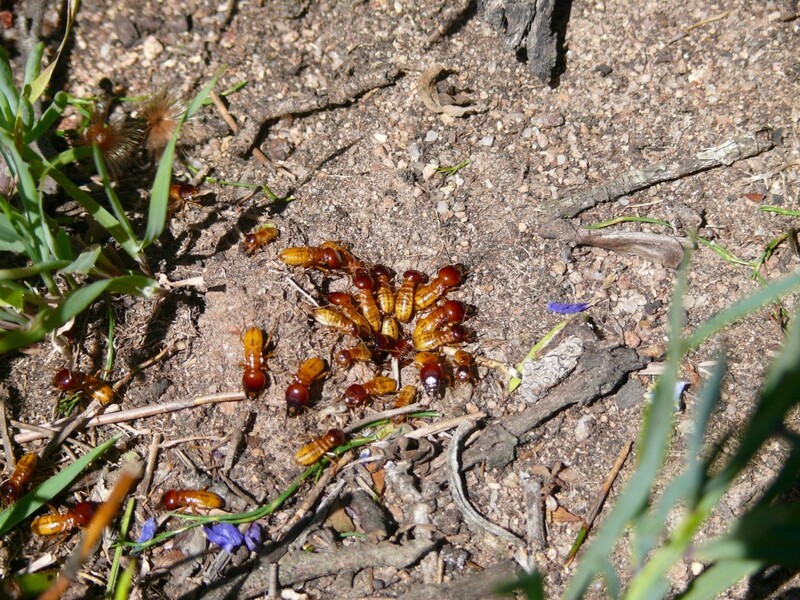 Alates leaving an underground termite nest through a hole in the ground with soldier and worker castes in attendance on the Gifberg above Vanrhynsdorp, Western Cape. On exiting the termitaria in their thousands usually after rain, assisted by workers and guards (Fig. 4a+b), the alates would disperse over a wide distance and on landing would find a mate, shed their wings and begin a new colony, their fat reserves seeing them through until the first workers begin to take over certain chores in a division of labour. To attract a male, the female would release a pheromone. This pheromone has a musty smell as witnessed in the camping ground of Moremi Game Reserve in Botswana where the staff switched on all the lights in the ablution block, opened the doors and windows wide and placed the plugs in the bath. The next morning the baths were filled with thousands of alates which were collected, gently fried and either eaten directly or placed into containers for later consumption. Nobody had a bath for several days due to the musty pheromone smell! Because the alates are eaten by almost every predatory creature from birds to lizards and baboons to mongooses, the release of alates from termitaria is usually synchronized, the cue being rainfall, and the area is saturated with them, allowing many to escape predation. Fig 4 a. Soldiers and workers around a hole in the ground on top of the mountain below which is the town of Aurora, Western Cape from which the alates were to emerge later. Fig. 4b. Workers and guards around a hole in the ground on the farm Zoethoek, north-east of Touwsrivier in the dry Karoo from which alates later emerged. Siyakha Mguni interprets the Toghwana Dam painting as a termite nest from which termite alates are emerging and the ’lit torch’ in the hands of the man as a stick with a grass bundle at the end to be used as a plug to block the exit hole as a common harvest strategy to ensure that large quantities of alates are collected in one haul. They could then control the emergence rate as the termites would have to remove the straw before again issuing forth the following evening (or during the day if overcast or damp). He supports his argument by linking the projections on the outer enclosure of many formlings as that of mushrooms which frequently appear on the surface of termitaria. 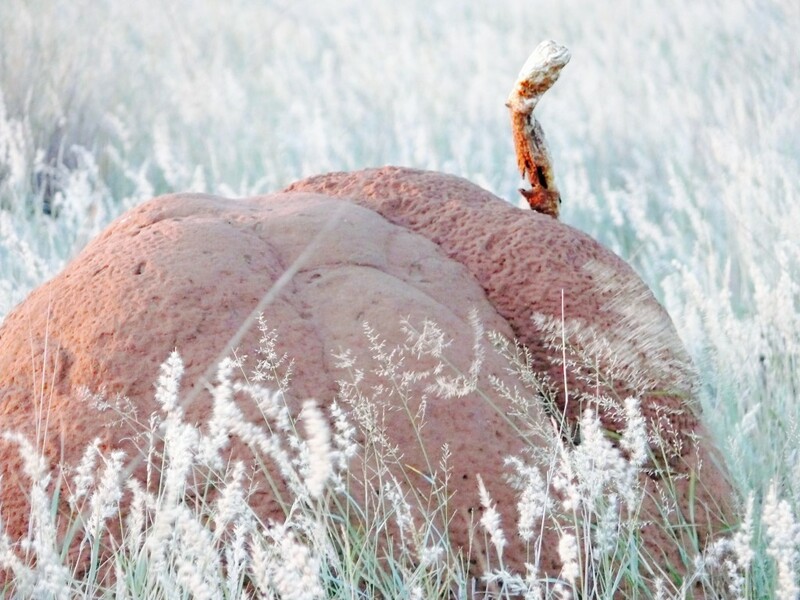 In wet seasons, from the fungus gardens of the symbiotic genus Termitomyces grow their fruiting bodies which appear as mushrooms on the outside of the termite mounds. An example of such mushrooms can be seen on this termitarium in Mokala National Park near Kimberley (Fig. 5). Fig 5. Fungal fruiting bodies (mushrooms) from the fungus which grows on the grass collected by the termites and on which the termites feed, appearing on the surface of the termitarium in Mokala National Park near Kimberley. Paintings of formlings are found in the hotter lowveld areas where fungus growing termite species proliferate but are absent in the colder high-altitude regions such as the Drakensberg and Maloti mountains. Here the eland takes on a greater spiritual significance, as do honeybees in the Drakensberg. Honeybee nests according to MGuni are also associated with termites and the fat that they represent, combs full of honey being referred to as being ‘fat’ by the San and ready to be exploited. Honeybees are associated in other ways with termitaria where they often nest in the hollow centre of deserted termite mounds (Johannsmeier, 1979) or in the hollow chamber leading into subterranean nests where they build narrow but long combs. The termite mounds of the snouted harvester termite, Trinervitermes trinervoides occur almost throughout southern Africa and honeybees gain access to the mounds through holes constructed by rodents and other small mammals. 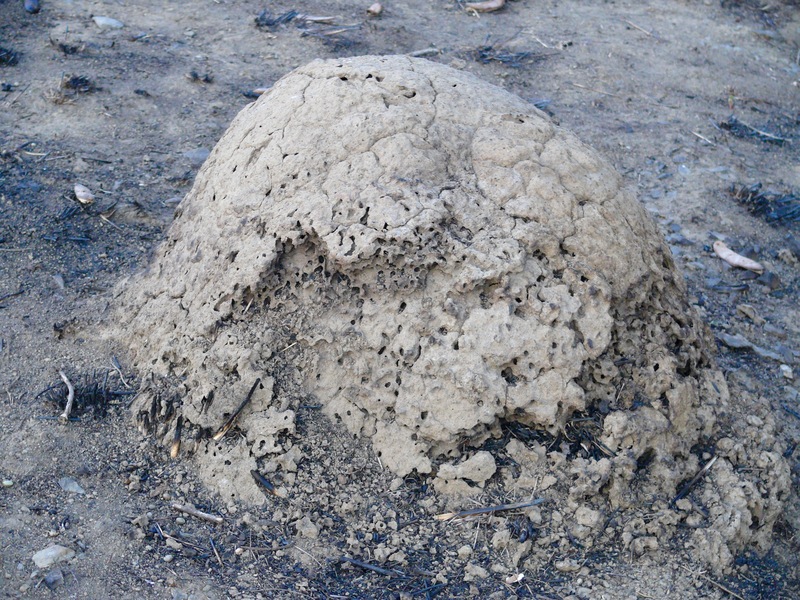 Often the centres of the mounds are hollowed out by the action of rhinoceros and other beetle larvae which feed on the accumulated grass fragments on which the fungus grows and on which the termites feed their larvae. A functioning termite mound in winter near Drakensville in the foothills of the KwaZulu-Natal Drakensberg. That of an abandoned termite mound showing signs of weathering. The San cosmos is an inseparable amalgamation of the natural and spirit realms. Trees are often associated with formlings because in nature termitaria often have trees growing out of them or the termitaria envelope them. Mguni’s interpretation of the San cosmos is of the termite nest in the earth as ‘God’s house’, with a tree growing out of it and into the sky which is also regarded as part of ‘God’s house’. Between the spirit domains of the subterranean and the sky is where the humans and other creatures live, and where shamanic mediation can connect the San with the cosmic realms. Bees and termites being social insects share symbolic associations in San thought and cosmology, there being a strong equivalence between fat (termites) and honey (bees) in terms of their physical character and manifestation in nature. When bees (as potent insects) swarm, they are believed to saturate the atmosphere with potency, and this is depicted for example in Botha’s Shelter (Fig. 6). The San believe that they are able to harness this potency from depictions of potent animals in their rock paintings and in their trance dances which help them to connect with the spirit world. Fig 6. 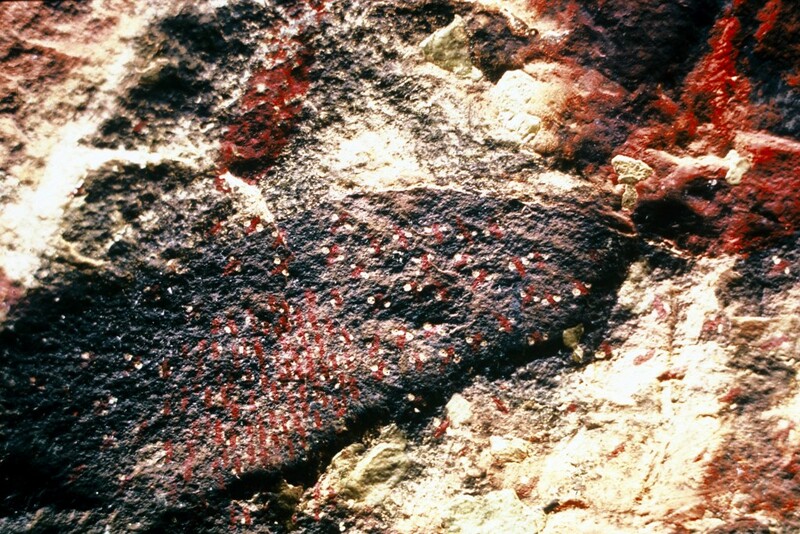 A swarm of bees depicted emerging from a crevice in the rock face in Botha’s Shelter, Ndedema (now Didima) Gorge, Drakensberg. Buchanan, S. 2015. Burchell’s Travels: the life, art and journeys of William John Burchell 1781-1863. Penguin Books, 240pp. Crane, E. 1982. The Archaeology of Beekeeping. London: Duckworth. 360pp. Guy, R.D. 1972. The honey hunters of southern Africa. Bee World 53(4); 159-166. Johannsmeier, M.F. 1979. 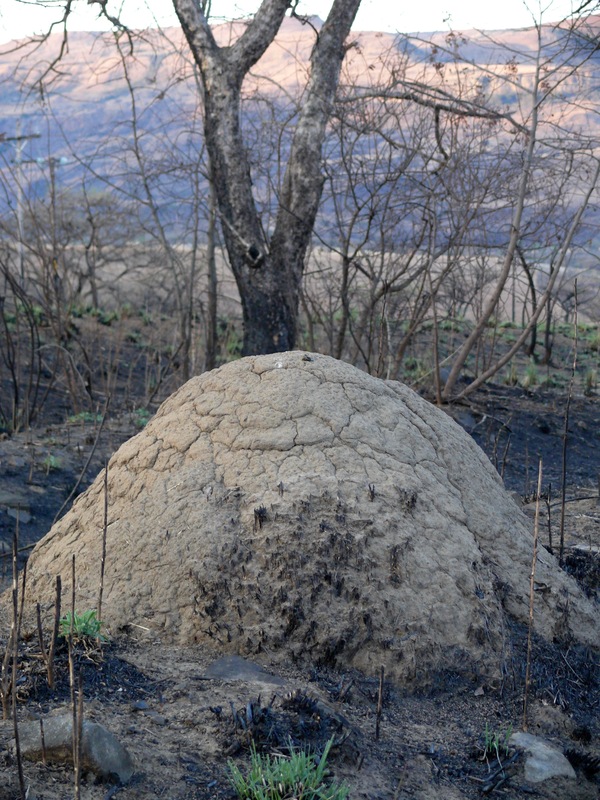 Termite mounds as nesting sites for colonies of the African honeybee. South African Bee journal 51(1): 9, 11-13. Pager, H. 1971. 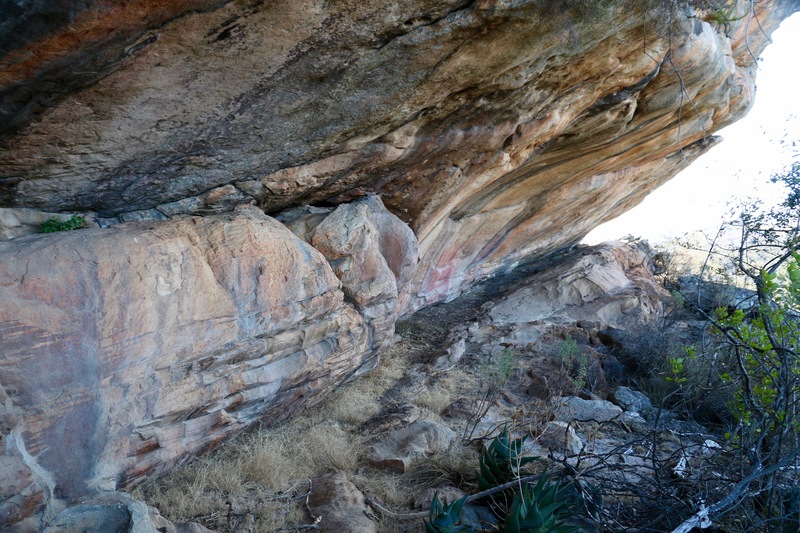 Ndedema: a documentation of the rock paintings of Ndedema Gorge. Graz: Akademische Druck- und Verlagsanstalt. Pager, H. 1973. 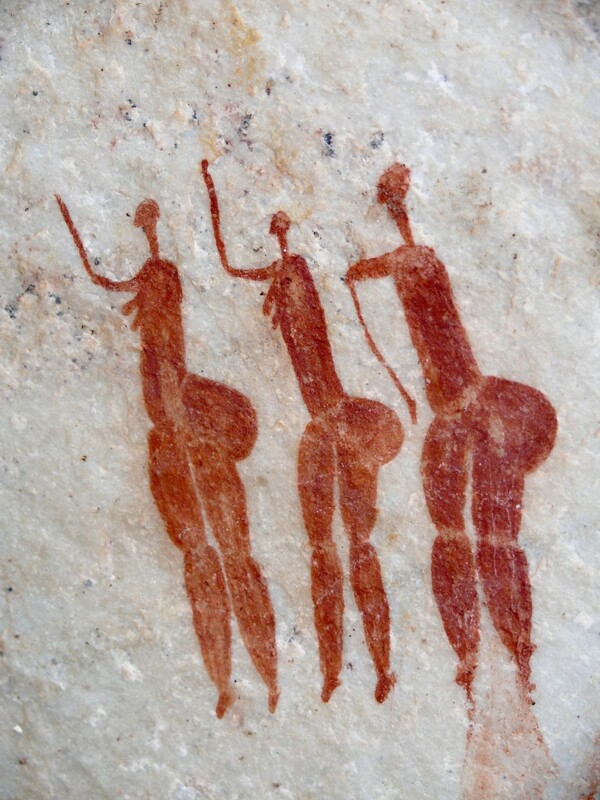 Rock paintings in southern Africa showing bees and honey gathering. Bee World 54: 61-68. This entry was posted in Uncategorized on December 22, 2015 by ujubee.